Additions to the ceremony package can include; the coloured sashes and wedding ceremony aisle decorations. The Herb Garden and Pavilion at Sydney’s Royal Botanic Gardens is a small and intimate wedding ceremony venue. We have a range of wedding hire decorations that are perfectly suited to this unique and beautiful venue. We highly recommend our softback wedding ceremony aisle, cascading down the steps of the Herb Garden Pavilion onto the flat aisle walkway. The softback carpet is one of our key features when choosing your wedding ceremony setup at this venue and not something every wedding hire business can offer. The wedding aisle runner is available in white only and at 1.5m wide and 9m long you will not find a more suitable aisle runner anywhere else. The Herb Garden & Pavilion can cater for a wedding ceremony of approximately 60 people. This would be considered the absolute maximum for this venue. 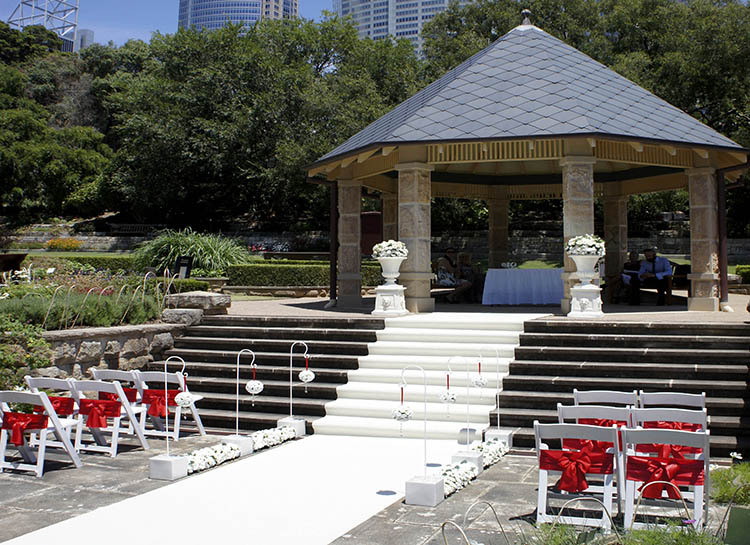 For the wedding ceremony chair hire we recommend a small number of white folding wedding chairs or tiffany chairs on the flat area in front of the Herb Garden Pavilion. Space is very limited and 12 to 16 wedding chairs is all that can be accommodated comfortably and usually in rows of 2. This does depend on the wedding ceremony aisle you go with. Adorable Wedding Concepts have the widest wedding aisle available, we want plenty of room for the bride to walk the aisle without brushing the wedding aisle decorations. You can add more chairs and squeeze in rows of 3 but this limits the available space for the wedding ceremony aisle decorations and very importantly, the space a wedding photographer has to maneuver themselves in and around the aisle without getting in the way of the guests and the bride. Wedding hire ceremony aisle decorations available at the Herb Garden and Pavilion offered by Adorable Wedding Concepts are extensive and perfectly suited to this wedding location. We recommend our low lying floral aisle decorations of white roses to line the wedding ceremony aisle on the flat surface before the pavilion steps. 3 to 4 aisle decorations on each side of the wedding aisle creates a very nice walkway and they’ll run the same length as the wedding chairs setup. Having just the low lying floral aisle is perfect for this Royal Botanic Gardens wedding location but if you are wanting to add more wedding aisle decorations we have available a variety of ceremony aisle decorations that accentuate the walk way. These include our white rose and hydrangea floral ball aisle decorations. The white roses are perfectly complimented with the soft green hydrangeas. We’ve created uniquely designed bases for our shepherds hooks which allows us to place them on hard surfaces and the design is particularly important when it comes to stability as they are heavy to ensure the aisle decorations will not fall over in any adverse weather so you can be confident that the wedding ceremony package will look exactly the same for the entire ceremony. Additional wedding ceremony aisle decorations include our use of shepherds hooks and coloured floral buckets available in a variety of colours. Add our white rose floral arrangements or choose your very own floral setting to complete the look and theme you want. We also have crystal lantern aisle decorations that add a completely different look and feel to the aisle. To compliment any wedding ceremony package, we love the use of colour and our coloured organza or silk wedding sashes are a wonderful addition to the last row of white wedding chairs. Go one step further and add them to each chair as part of your wedding hire package. Coloured sashes are a brilliant way of breaking up an all-white wedding ceremony setup. Our range of coloured wedding sashes is huge, approximately 50 different colours, so we’ve got you covered no matter what you’re looking for. The final wedding hire item for the Herb Garden and Pavilion is the wedding ceremony signing table and chairs. Sitting at the top of the steps just back from the wedding ceremony aisle, perfectly positioned under the pavilion, we have available a skirted signing table with white padded wedding chairs the same as the guest chairs. You can add coloured sashes to the chairs to match the guest chairs. Alternatively, we have an iron signing table and matching chairs. You can add either of these to your wedding ceremony package. Adorable Wedding Concepts have a huge range of wedding hire and decoration items and we offer wedding ceremony packages pre-styled to help you with the planning of your wedding day. All our wedding packages can be customised by adding decorations or hire items to the ceremony setup. We look forward to hearing from you, either call 0418 624 225 or go to our enquiry page and send us an email for an obligation free quote and consultation. Unsure about the Herb Garden & Pavilion as a venue? Contact us to discuss the style of wedding and type of venue you are looking for and we can provide you tips and insights from our 15 years of experience in the wedding ceremony industry. Guest Access: The Herb Garden & Pavilion at the Royal Botanic Gardens is accessed from the Palace Garden, Morshead Fountain and Conservatorium gates (all accessible off Macquarie Street). What you need to know: Royal Botanic Gardens allow 1 hour setup prior to the start of the ceremony booking time and will not allow access prior unless special prior arrangements have been made which involve additional site booking fees.